A manual of medical jurisprudence for India, including the outline of a history of crime against the person in India. Calcutta, Bombay, London : Thacker, Spink & Co., Publishers to the University, 1870. Description third edition : bt, frontis. pl., tp, [i]-xxiv p., -861 p., [3 l.] pl. ; ill.: 1 phot., 3 woodcuts ; 25 cm. Photograph : albumen mounted on printed leaf, body of Rose Brown, victim of the "Amherst Street Murder." Photographers : Saché and Westfield (John Edward Saché (1824-1882) & W. F. Westfield). Subject : Cadaver — Forensic medicine. Author caption: By Norman Chevers, M.D. ; Surgeon-Major H. M. Bengal Army; Principal of the Calcutta Medical College, Professor of Medicine, and Senior Physician in the College Hospital; President of the Bengal Social Science Association. Medical training, Guy's Hospital, London. Postgraduate training, pathology, Guy's Hospital, 1839-1848. Assistant Surgeon, East India Company, Bengal, 1848. Civil surgeon, Parulia, Chittagong, and Howrah districts, India, 1848-1855. Secretary to the Medical Board of India. Secretary to the Director-General of the Medical Department, 1861. Inspector-General of Jails in Bengal. Professor of Medicine, and Physician to the Hospital, Calcutta Medical College, 1862. Surgeon, Calcutta Medical College Hospital, 1862. Honorary Physician to Queen Victoria. President, Sanitary Branch of the Social Science Congress, Birmingham. GM-2752: "Observation on the diseases of the orifice and valves of the aorta," 1842. Photo caption: Photograph by means of which the victim of the "Amherst Street Murder" was identified. See also p. 424. Index Medicus: 10703331110 (1st ed., 1854), 10209301210, 10703181170 (2nd eds., 1856), 10209301220, 10703181180. I remarked, in the Edition of 1856, that there could scarcely be a doubt that Photography would, before many years elapsed, be employed throughout India as a be employed throughout India as a means of identifying bodies, anticipating the disfigurement of rapid decay, and enabling the magistrate and the civil surgeon to examine, in their offices, every detail of a scene of bloodshed, as it appeared when first disclosed to the police, in a place perhaps sixty miles from the sudder station, which no activity on the part of the police or themselves could enable them to visit in time. This process has already been employed, with advantage, by the police at home, in the identification of old offenders ; and I expressed my confidence, that no measure would afford more aid to police inquiries in India, or impress more vividly, even upon the minds of the ignorant and superstitious common people, a conviction of the difficulty of eluding our vigilance and of our accuracy in the detection of crime. Although many uneducated natives are scarcely able to comprehend the meaning of ordinary pictures, we have yet to judge of the effect which would be produced upon the conscience of a hardened savage, obstinate in the denial of guilt, by placing before him, in the stereoscope, the actual scene of his atrocity—the familiar walls, the charpoy, the ghastly faces—as they last appeared to his reeling vision;—the sight which has haunted his brain every hour since the act was done—while he believed to certainty, that its reality could never come before his eyes again. Every Magistrate and Surgeon will perceive under how many circumstances photography could be made available. It would be especially useful in showing the actual position of the body in cases of hanging, strangulation, &c. The experiment certainly deserves a portion of the time and consideration of judicial and medical officers; and a few successful trials would recommend it to the attention of Government. Although the difficulties of rendering such a system general would, of course, be numerous, there is every reason to believe that the expectation of reward would encourage many young and intelligent darogahs to master the art of taking sun pictures, which is already easy, and which will, doubtless, be further simplified in the hands of the many who now give it their attention. Photography has occasionally been employed as an aid to police and medico-legal investigation in India. I am indebted to Mr. John Blessington Roberts, coroner of Calcutta, for photographs by which alone the remains of Rose Brown, whose dead body was found in a Calcutta street with the throat cut in 1868, were identified.—Pages 74-75. Chevers's enthusiastic remarks – first written in 1856 and reprinted, almost verbatim, in the second edition – were representative of the epistemological discourse that attended the dawn of photography and continue to this day, namely, the camera's role in the instantiation of identity within social structures and heirarchies. Chevers overstates the power of the camera to move the conscience of a hardened criminal to confess his crime, but he was prescient in his views of the adaptation of photography for criminal control. In the first three years after the Prevention of Crimes Act of 1871, police photographed 117,568 people in England. In France, 60,000 portraits of criminals were on file. 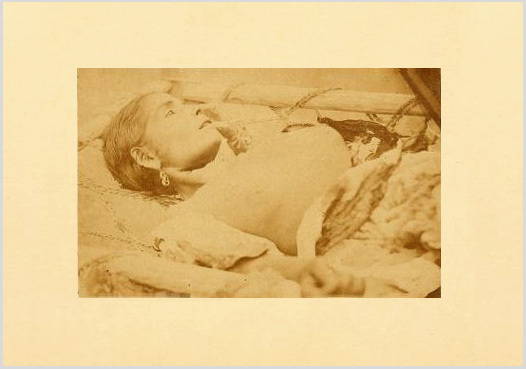 The identification of Rose Brown's body was made possible by the dissemination of her photograph, taken the day after her body was discovered and moved to the Calcutta Hospital morgue where Chevers was chief surgeon. Her demise led to the establishment of the first detective force in India.